Last week saw the hosting of the Prep 1 and Prep 2 Art Exhibition at the Helix gallery. The boys’ work was displayed in the public gallery and a special opening evening was attended by parents, boys and teachers. The venue was awash with colour from the Prep 2 watercolour paintings of tigers in the jungle inspired by Henri Rousseau, the reduction prints made by Prep 1 and some crayon Batik still life pictures also produced by the boys in Prep 1. 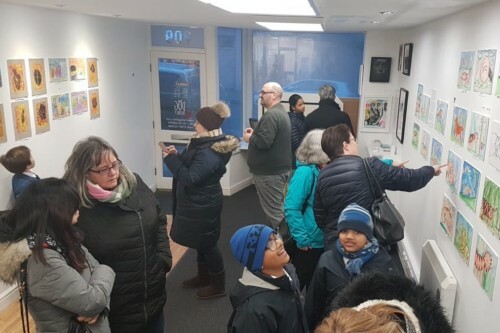 The boys were delighted to see their artwork in a public place, and with many boys visiting the gallery on the Saturday with their parents, the exhibition was a triumphant success. The paintings that were displayed are a credit to the boys and a demonstration of their enthusiasm and commitment to developing as young artists. Well done to all the boys for another successful show.